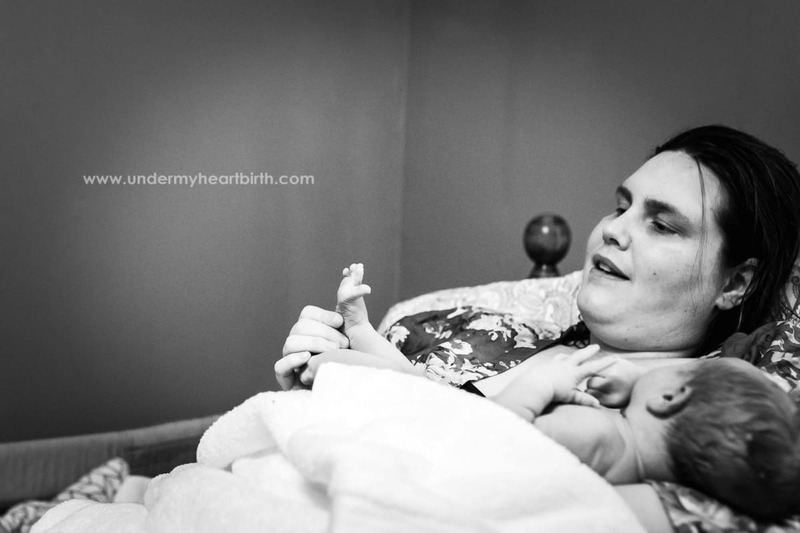 Following a traumatic first birth that ended with a cesarean, Sarah opted for a vaginal birth after cesarean (VBAC) at home. 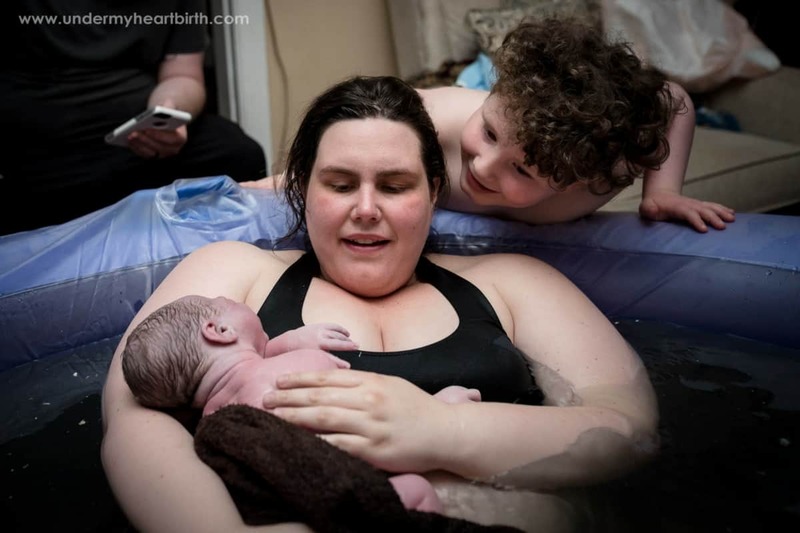 This is her plus size VBAC homebirth story! My birth was a pretty freaking incredible day. Letting my baby choose his birthday was very important to me. Contractions became steady around 8:00 am on Thursday. I reached out to my birth team. My Husband took Jameson to school and we called up the local doggie daycare to handle our pup. By 9:00 they were 4 -5 minutes apart but I still felt totally fine and in-control. Ben and I spent a few hours just talking and anxiously awaiting our new baby! My sister picked Jameson up from preschool and kept him until around 5:00 pm. We were hoping he would come home to his new sibling, but this little guy wanted to take his sweet time! We decided to go to the store and let our oldest pick out a birthday cake for his new baby brother/sister. The rest of the evening we spent trying to relax, although it was becoming more difficult for me. By 8:00 pm I wasn’t feeling as perky. Contractions hadn’t become closer together or stronger, but hadn’t let up much either. I was texting with my doula/photographer Jess throughout the day and by 9:00 pm I just wanted her with me. Mentally I was starting to get nervous and physically 13 hours of contractions were really starting to hurt. I couldn’t sit through them and was having trouble relaxing at all at this point. By the time Jess arrived at around 11:00 pm I was so ready to just get this over with. Jess was amazing. She tried every way possible to get me into a comfortable spot, including relaxing in the birth tub. It did help somewhat. I would be able to fade in and out of the waves for a few hours. After a while, Jess tucked Ben and me into bed. We spent the next 4 hours trying to get some rest. Jess promised we would all feel better when the sun came out. I trusted her and tried to rest but I didn’t get much sleep. As soon as the sun came out I was up again trying to get the baby moving along. I called my midwives around 6:00 am and they arrived about an hour later. I had no idea how long I would have to wait for my little one to arrive, but I do remember looking around thinking everyone seemed a lot more patient than I felt! The morning seemed to crawl and I was in pain and couldn’t relax. I spent a majority of the time hugging – I hugged everyone! 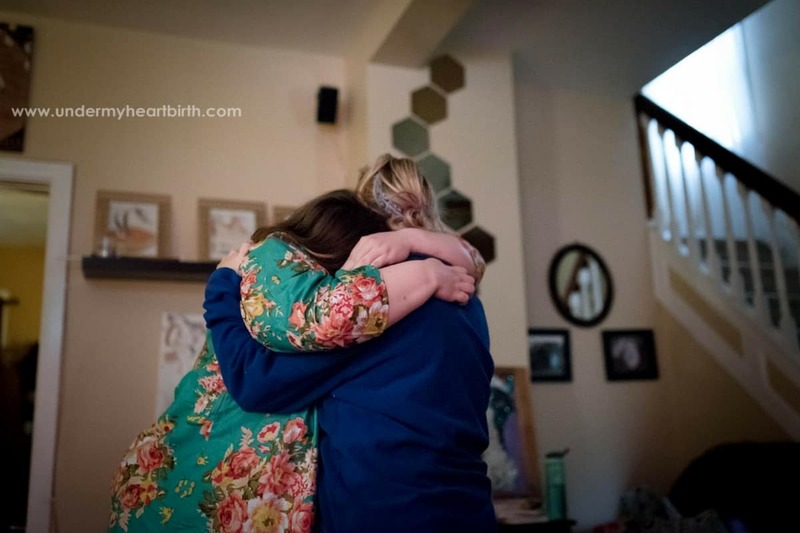 Hugging and swaying was the only relief I could find during the contractions. By 8:00 am they sent my husband upstairs to nap with our oldest who was still in bed. The next few hours I spent doing lunges on the stairs, walking back and forth in the kitchen during contractions. In my mind, I contemplated how to convince everyone to take me to a hospital. I wanted to be done! Around 10:00 am everyone was in the living room and I was just about to tell them I was done when Jameson ran downstairs and gave me the sweetest kiss and said: “I’m going to be a big brother today”. I don’t think there was a dry eye in the room – I needed to hear that! After regaining some confidence, my midwives decided they would check my cervix to see how far along I was at this point. I was terrified of this. My first was born via traumatic c-section due to failure to progress. I was so afraid that after 26 hours at this point I would be only 4 or 5 centimeters dilated. My midwife Meribeth checked me and said I was complete. She could break my water to get things moving. I trusted her and knew she wouldn’t have suggested that if it wasn’t time. She broke my water and Finn was on his way! The next hour was pretty intense. I had never pushed a baby out before and was nervous about how that was going to go. My other midwife Jen asked me to squat like a frog to start to bring the baby down. At first, I told her no way, that was just not going to happen. The idea of doing that felt insane to me. I was hurting and that was not in a position I felt comfortable in, when not pregnant or in labor! After some bargaining with some time in the birth tub, I agreed to try. We used the rezobo as leverage and I squatted. My body began to push on its own. I could only imagine what face I made to Jen when that happened. That was one of the most amazing feelings of my life. My body did know what to do, and it was doing it! It felt good to finally make progress. My baby and I were working together and he was getting ready to meet the world! I spent about 30 minutes like this when Meribeth asked me if I wanted to get in the tub and I was so excited to finally enjoy the water. Unfortunately, the water wasn’t quite warm enough, and I remember my husband walking back and forth as fast as he could with hot water from the kitchen. Finally, I was able to get in, and it felt magical. 10 minutes of pushing and Finn’s head was born, a few pushes later and he was here. I couldn’t believe it! Jameson was also so excited to announce that the baby was a BOY just like he had hoped. I felt amazing. I did it. My body did not fail. Taking a shower at home and being tucked into our own bed was just icing on the cake. We were now a happy family of 4! 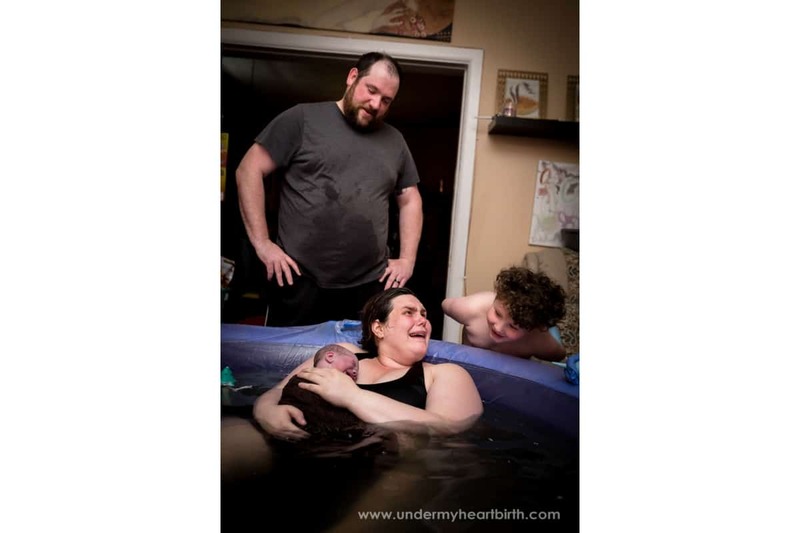 All of these beautiful photos were taken by Sarah’s doula and birth photographer, Jess with Under My Heart Birth Services. 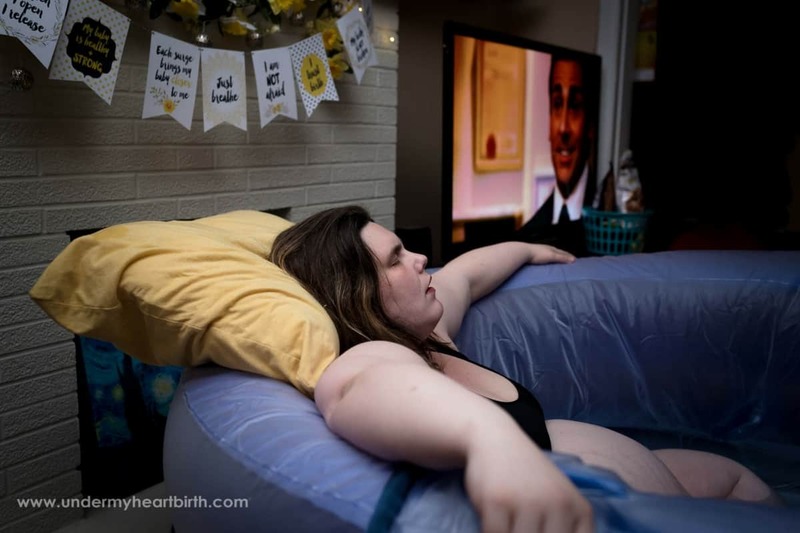 If you enjoyed reading this plus size VBAC homebirth story, be sure to read more plus size birth stories linked below. 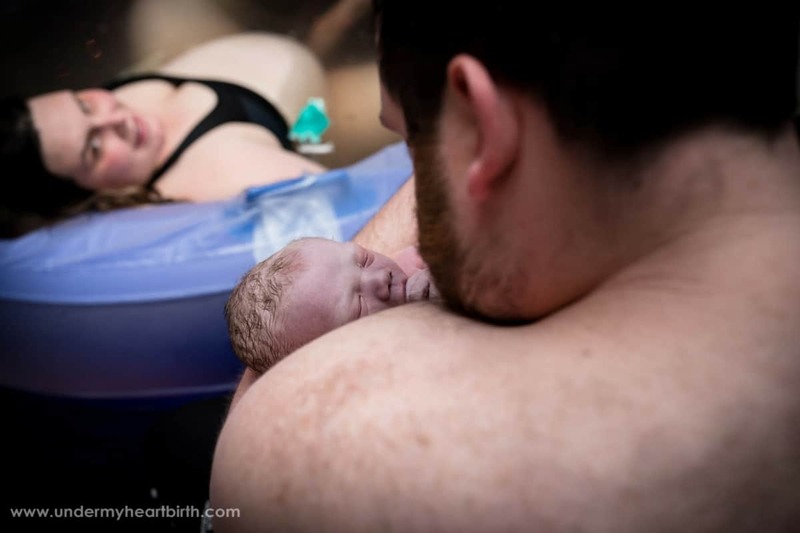 You might especially enjoy My Ultimate Birth Experience: Plus Size Water Birth, The Birth of Maya (Home Birth in Canada), and VBA2C: My Body is Not Broken. I love this! I am a big girl and I just had a HBAC also 🙂 I have had a hard time looking at myself in the pictures of labor and birth. I saw these and it has helped me let go. You look so beautiful, thank you! Thank you for sharing! I’m so happy for you Maegan! 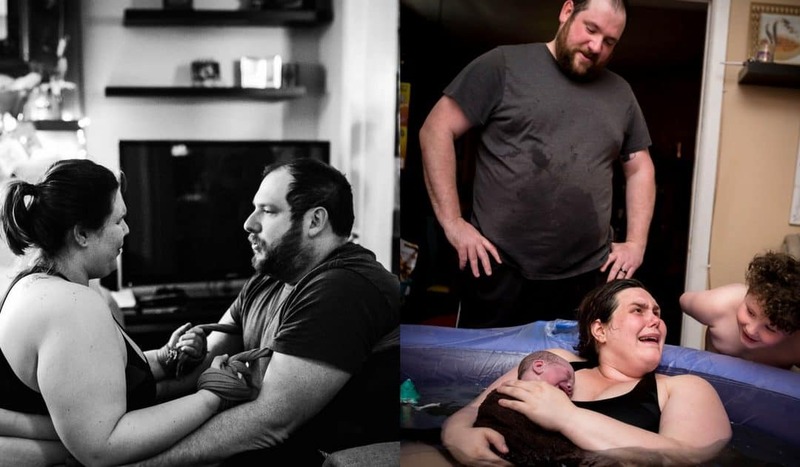 To be honest, it took me a few years to fall in love with my birth photos too. Now, after seeing so many other beautiful moms share, I adore mine. I hope you fall in love with yours too! Simply beautiful. Congrats to you and your family. Your story out me at ease…especially when I saw The Office playing in the background! I’m so glad you enjoyed Sarah’s story! Thanks for also letting us know about the new podcast. 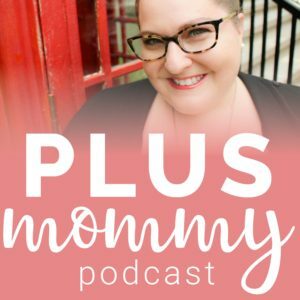 We’ve actually just launched our own podcast, https://plusmommy.com, and hope to be sharing some birth stories soon! We also just interviewed Jen Kamel of VBAC Facts for the show so you’ll enjoy that episode when it airs.